SRtRC Coaches Derek Ferguson, Michael Weir, and Gary McKay went along to Meadowmill Sports Centre in Tranent to support the opening of the 2011 East Lothian Youth Games. Show Racism the Red Card Coaches Derek Ferguson, Michael Weir, and Gary McKay went along to Meadowmill Sports Centre in Tranent to man a Red Card stall in support of the opening of the 2011 East Lothian Youth Games. The day was organised by Stephen Duff, Principal Officer - Sports Development, and included a range of sporting activities for the young people to get involved in, including football, basketball, badminton, hockey, rugby and volleyball. Stephen Duff said “The guys were fantastic on the day and the stall proved very popular with the school children”. 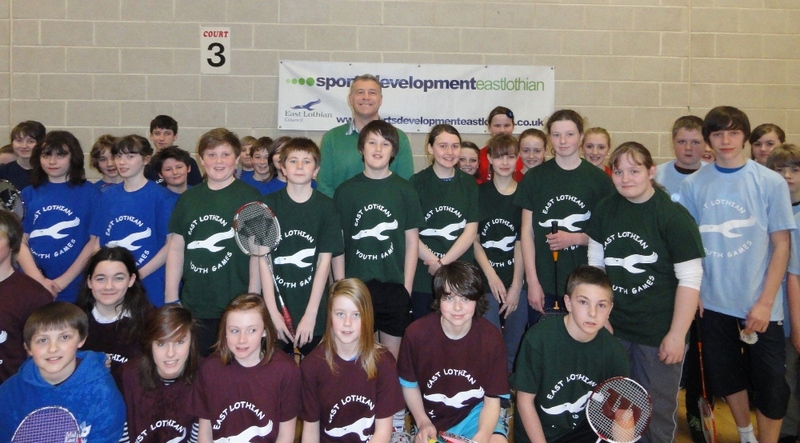 Scott Hastings, Scotland’s most capped rugby player spoke at the opening ceremony and is pictured here with some of the badminton players. SRtRC are working in partnership with East Lothian local authority in 2011/2012 and are looking forward to delivering anti-racism workshops to every S1 pupil in all six high schools across the area during National Sports Week from the 6th-10th June.